He isn’t a mute stone idol. Contrary to popular belief, God isn’t just the Author of a set of rules to be obeyed, or a clever philosophy on how to make life a little better. The big secret about hearing God’s voice is…there is no secret! 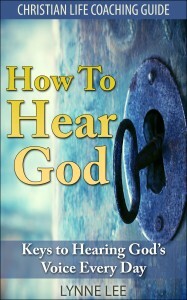 This book presents an uncomplicated and practical guide to hearing God. The fact is, God wants you to hear Him even more than you want to hear Him. He even promises that His sheep (that’s us!) will hear His voice. Anybody can hear God. In fact, you probably already hear God every day, you just don’t always recognize that it is God speaking to you. This coaching guide equips you to recognize God’s voice, even if your prayer life is currently weak or even non-existent. God wants to become more real to you than you can imagine. He intended prayer to be a two way conversation, two way dialogues between you and Him. This coaching guide is designed to help people who don’t think they hear God’s voice to know when they do – and also to help people who already hear God, to hear Him more often and more clearly. Whether you’re just starting out on this exciting journey; or you already hear God but want to develop a deeper intimacy with Him, you will find essential keys to hearing God speak to you about everything from life changing decisions to everyday issues. Step inside and prepare to embark on an adventure with God that will transform your life forever! Would this be deliverable in a home group weekly 6-8 week sessions? A lot of people have bought this coaching guide to use as a devotional. It lends itself well to study on a small group. If you were planning to study it over 8 weeks, you would probably need to aim for between 2 and 3 chapters each week. That is doable because the chapters are short and easy to consume. I hope that helps. I’m glad it’s hitting the mark, thank you for taking the time to encourage my heart. Hi Lynne I sent you email last week via through your christian website regarding website as I am interested in purchasing it and have my site up and running asap, but before I do I had some questions that I email to you. Please get back to me if you received it. Lynne Lee's book How to Hear God is for you! This book proves, through scripture, logic and personal experience that God desires to speak to us, that He does speak to us and that we can hear Him and know how to respond. A must read for anyone who desires more intimate communication with their loving, Heavenly Father. Lynne Lee's How to Hear God contains more than two dozen ways you can discover and tune into the voice of your beloved Creator. Practical and in step-by-step fashion, Lynne addresses key concerns in hearing the voice of God, such as discerning whether a voice is Divine or just you. If you want to enjoy the extravagance of God's heart, hear His wisdom throughout the day, and allow Him to express His abundant life through you, How to Hear God will guide you along the most adventurous journey of a lifetime. How to Hear from God is packed full of practical ways you can hear from God. Lynne has written a comprehensive guide with many valuable insights and step by step instructions on how to hear from God. Her tone is reassuring, encouraging and supportive. This will be exceptionally valuable for someone beginning to hear from God. However, even if you're experienced at hearing from God, you'll pick up some valuable tips to increase your ability to hear from Him. I'm impressed with how practical and doable Lynne's insights are. Relationship with God is what it's all about and if you want to grow in your ability to hear from God, I recommend you read this book." Lynne's latest book is filled with solid advice if you desire to hear God's voice. She has compiled years of experience and research into a fairly comprehensive book that is guaranteed to help you eliminate some of those nagging questions and self-doubts when it comes to accurately hearing God as He leads you through your life. This book has inspired me to renew my relationship with God. It gives the reader an easy and practical guide of how to hear the voice of God. So many lives will be changed for the better when they read this book. Lynne, you are bringing much needed truths to the Body of Christ with simple words of understanding. This is a must read for every Christian. In the times that we live in now, we all need to hear clearly what God is saying.